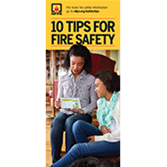 Ten simple, easy-to-follow tips are the "Golden Rules" of fire safety everyone can follow -- and they're great for handing out at open houses and community events. Tips are written in a brief, simple-to-understand way, and are easy to follow and remember! They cover everything from cooking, smoke alarms, candles, and escape plans to electrical hazards, space heaters, and more.